The French business culture has always held a strong place in the world in terms of its diversity, professionalism, and innovation; however, staying on top of all of the latest stories happening in France is quite a difficult thing to do. Buy a single copy or subscription to L'Expansion magazine. 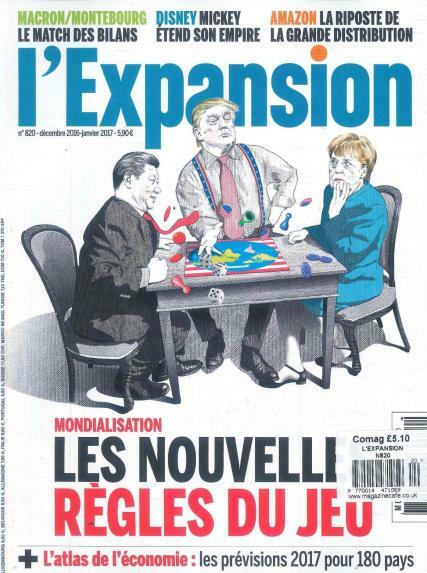 Whether you have business ties with France, you are looking for French business opportunities, or you just have an enthusiasm about everything French business related, then L’Expansion magazine is the one magazine that you should certainly read. From their deeply informative business articles to the latest breaking news, L’Expansion magazine is an entertaining, educational, and most importantly, professional. No matter what is happening on the French business scene, L’Expansion magazine will absolutely cover it with their team of highly skilled and knowledgeable writers and editors. Additionally, with every issue of this fascinating publication you will be taken deep inside and given an exclusive look at all of most interesting things happening in both Paris and everywhere else in France.